Highland Park is, as I have noted before, generally associated with maturation in sherry casks. To find a bourbon cask matured Highland Park you have to go to the independents, and among the independents too it can be hard to find ex-bourbon releases (especially in the US, where we seem to mostly get refill sherry bottlings, usually from Signatory). 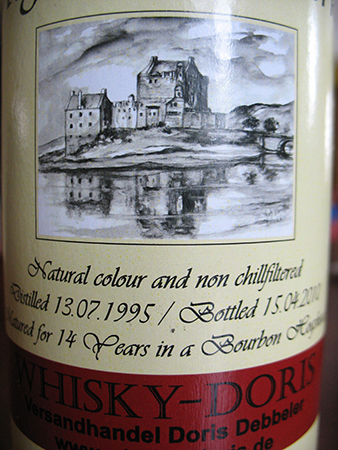 The bottle I am reviewing tonight is from a German bottler/online store with the wonderful name of Whisky-Doris, owned by one Doris Debbeler–I don’t know if her friends call her Whisky Doris, but I hope they do: I can think of very few better honorifics. Nose: Surprisingly peaty along with a minerally, stony note that is more than a little reminiscent of Caol Ila (though this is not as peaty as your average Caol Ila and there’s nothing phenolic about it). There is also a strong resinous/woody note–pine? eucalyptus? After some time it begins to smell like an old, polished wooden box. A very pleasant musky, fruity aroma joins the party as well–I want to say melon, maybe a hint of tinned pineapple as well. With more time still, a strong briny note comes to the fore, and there’s something almost almondy there too (in the way that almonds can be both mild and bitter at the same time). With a lot of time, the peat and the brine mellow. With water: becomes more pungent again, but now with acidic fruit leading the way; something chalky about it too. With a little more airing the fruit gets sweeter–the piney notes are now gone (or has my nose just adjusted to them?). Palate: The first impression is of the peat, followed by the sweet eucalyptus/pine. A big acidic fruity note develops right after and on its heels comes quite a massive wallop of dry wood smoke. Quite briny too. This is pretty wild–very, very far away from the official distillery profile. Water mellows the peat on the palate as well, but really expands the pine/eucalyptus note which now is quite nicely complemented by musky fruit of some kind–there’s some lime in there too (I’m going to go out on a limb and say that it’s reminiscent of kaffir lime peel). Finish: Long; quite smoky at first, and then a lot of salt. The final lingering impression is of ash, which hangs around on the palate for a long time. Water mellows the smoke on the finish as well, and brings out some mildly bitter wood notes. Comments: They say that a lot of distilleries are hostile to independents partly because they would like to define their identity entirely in terms of the profile of the whiskies they vat or release as single casks–and independents who largely release single casks can muddy this perception/”image” by releasing idiosyncratic casks. Well, I don’t know where Highland Park (or more likely the owners, the Edrington Group) fall on this issue but this Whisky Doris bottle is, as I noted above, as far away from the Highland Park as could be imagined: no sherry, obviously, but far more peat than normal, and also far wilder than the normally balanced and elegant distillery offerings. In many ways, it puts me in mind of Longrow and Clynelish (when it’s a little more peated than it usually is). I have to say I love it; not so much because I prefer this profile to the official one (I don’t), but because as an unabashed fan of this distillery it’s great to see how good its distillate can be even when it is least like its usual self. Vive le différence! 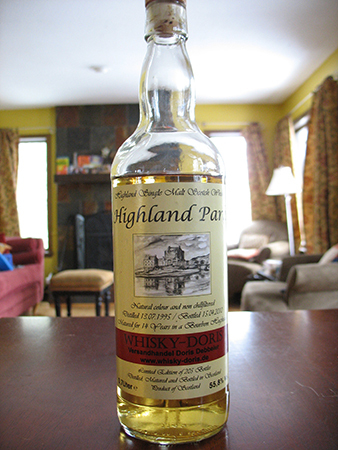 This entry was posted in -Whisky by Rating, 85-89 points, Highland Park, Whisky by Bottler, Whisky Doris. Bookmark the permalink. You can’t keep a Doris down. Doris Day, Doris Lessing, Doris Roberts…if you want to make it in the world you might want to change your name to Doris.